Event in London at Dept. of Work and Pensions. DPAC is delighted to extend an open invitation to celebrate Independent Living Day with us on the 4th of July at the ‘Independent Living Tea Party ‘. The party will begin at 2pm at the DWP, Caxton House in Tothill Street SW1. There will be fun & games, and entertainment; and of course, some civil disobedience. We have come a long way since the demand for Independent Living was first made nearly 50 years ago. Then, as now, IL was our solution for how society supports disabled people to take our place as equals. For how society addresses inaccessible institutions, structures and process it created, which do more to disable people than their impairments ever could. · Transport – the withdrawal of Taxi-cards, freedom passes and the halting of planned works to make infrastructure more accessible, amongst a host of other cuts combine to make disabled people second-class citizens in society. But we have fought this fight before – and won. Our Disabled Peoples Organisations, legal gains and the policy victories we have won previously are testament to the power, know how and skills disabled people have to develop solutions to problems created by society. We must celebrate these achievements and remind ourselves that each of these successes have had to be earned, no-one ever gave them to us without a struggle. So celebrate with us, or alternatively create your own party. Get together with friends and supporters, and create the kind of vibrant, positive spaces we have always created. Bring the noise – bells, whistles, drums, pots & pans etc. Bring food to share. Bring your enthusiasm. focus on the important issues locally; support, education, transport etc – its up to you. Identify what you want to celebrate and who represents the biggest threat to that locally. Is it your local council or Uni? Is it a transport provider? Or is it someone else? yes, EVERYONE. Media, campaign networks, activists, local people. DONT FORGET TO TELL DPAC so we can list and support your action! make your event loud and proud. Bring music, choirs, drum, bells, whistles. Remind everyone out there that we won‘t be separated from society, we are society. We won ‘t go quietly. 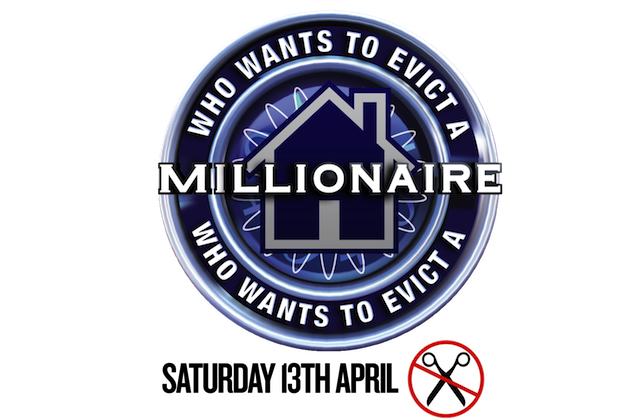 details to follow, watch this space. The famous Boston teaparty led to a revolution against the British government let’s see where our teaparty leads….. In a genuinely historic move, every trade union in the UK has signed up to a sustained general strike against austerity which could begin in the next few days Unite leader Len McCluskey has confirmed. Disabled People Against Cuts are serving an eviction notice on Iain Duncan Smith, Secretary of State for Work and Pensions, in the front garden of his mansion! 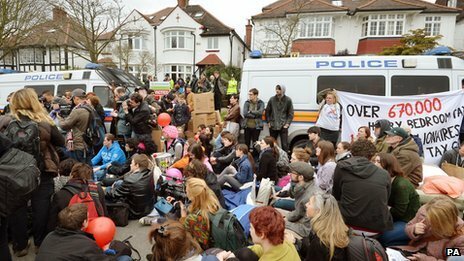 Protests have also been carrying on at David/Lord/Baron Freud’s (Welfare Minister and architect of the recent reforms who switched from Labour to the Tories around time of election) with UKUncut ‘Millionaire eviction specialists’ white van and many activists on foot paying him a visit. and the festivities carried on from 5pm on Monday 8th April until 6am the following day. Meanwhile, Ding Dong, the Witch is Dead from the Wizard of Oz has hit no. 10 in the mid-week official charts … it currently sits at number two in the iTunes download chart and is already number one on Amazon. It’s hard to believe but Margaret Thatcher is really gone for good. A long standing plan to celebrate this joyous occasion will be enacted in Nottingham today starting at 5pm in the Market Square and will go on for some time so come whenever you can. We won’t forget the rest of them but that can wait for one day (part 2 is supposed to be in Trafalgar Square on Saturday). Bring banners, placards, bells & whistles. Update 9/4/2013: Celebrations… [ http://www.mirror.co.uk/news/uk-news/margaret-thatcher-dead-video-cheering-1818888 ] were had across the land. 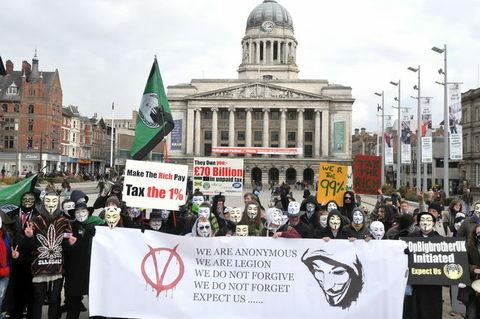 In Nottingham the Old Market Square festivities featured anti-poll tax banners from 1989-90, red and black flags and party poppers, plus a contemporary alert about Council Tax benefit changes. Partying continued at the Stage and impromptu event at the Chameleon Cafe Bar. Here are photos of the anti-workfare demo in the snow, that took place in Nottingham City Centre yesterday to highlight the continuing scandal of forced unpaid work for people who receive welfare. 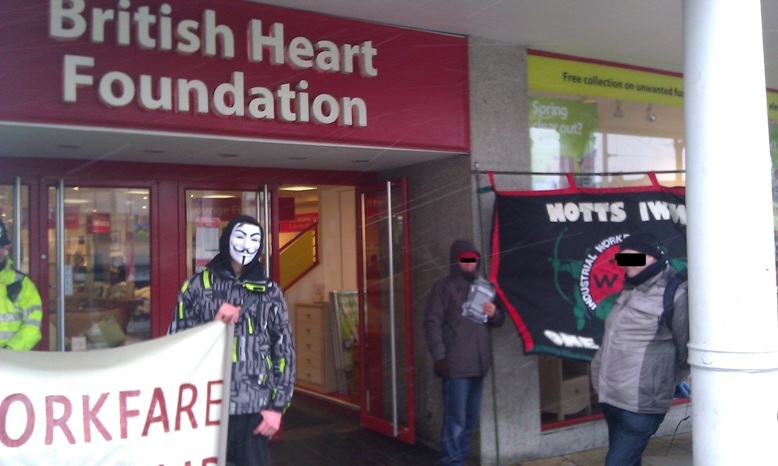 Four shops were visited that are involved with workfare (Burton, British Heart Foundation, Debenhams, Poundland). Leaflets were handed out and shops were entered to speak with workers and customers. Workfare profits the rich by providing free labour, whilst threatening the poor by taking away welfare rights if people refuse to work without a living wage. 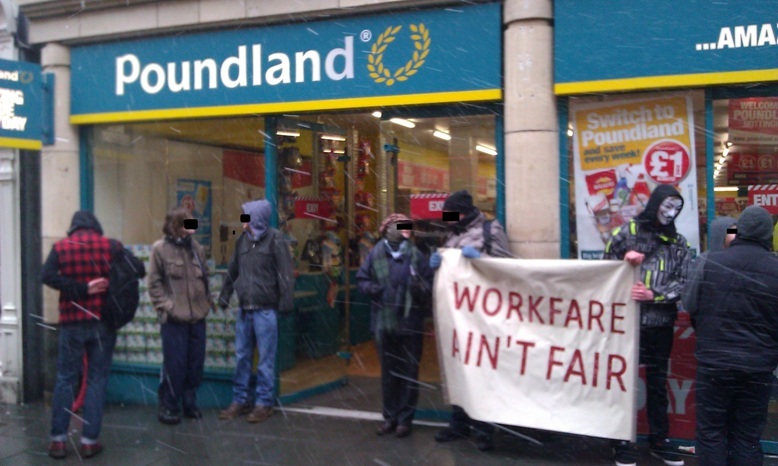 The Boycott Workfare campaign, which is acting as an umbrella for actions such as the Nottingham one organised by Notts Against Workfare, has compiled a list of workfare providers including the four visited on Saturday in Nottingham and is also asking for information about any other shops or companies who are using workfare (they may be local independent businesses as well as the more well known high street names). 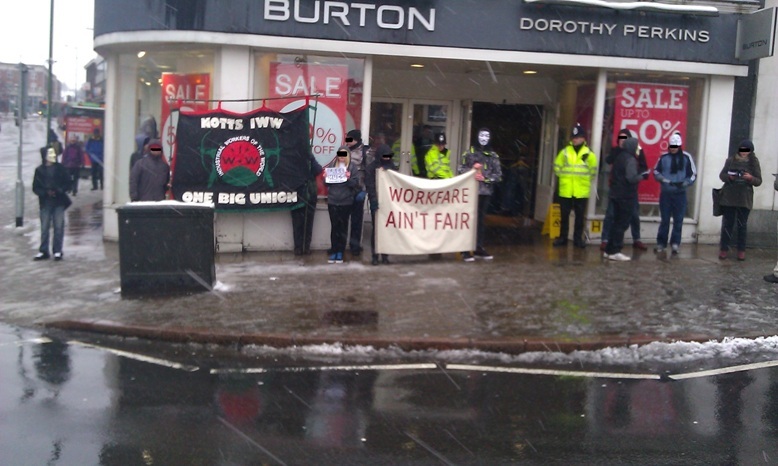 You can contact Nottingham Against Workfare by emailing nottsagainstworkfare [at] riseup.net and visit the Facebook page to find out more (details here: https://nottssos.org.uk/2013/03/01/burton-blockade-against-workfare-saturday-23rd-march-2013-2-00pm/ ). Jobcentre was set targets for benefit sanctions, The Guardian, 21/3/2013. Up to one hundred demonstrators assembled in Old Market Square and proceeded to blockade tax-dodging firms such as Starbucks, Vodafone, banks, etc. People passing by responded very positively. Some joined in the fun. The police followed the demo around but kept a low profile. The mainly young people participating were very lively and positive. 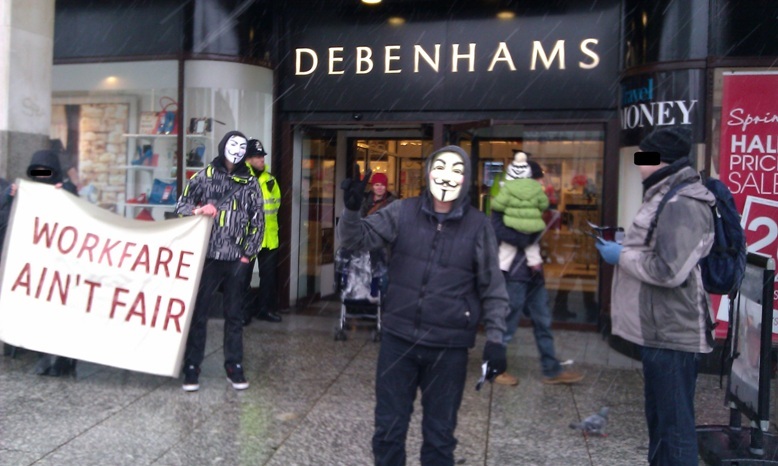 Anonymous are to be congratulated for organising this direct action.